Check out Tobi's Albury High Rise Distressed Denim Skirt Live life on the edge with the Albury Black Distressed Denim Skirt. This ripped denim skirt features an A-line construction, high waisted fit, raw hem, zipper and button closure, and distressing at the sides. Pair this edgy skirt with a moto jacket and combat boots for a tough look. 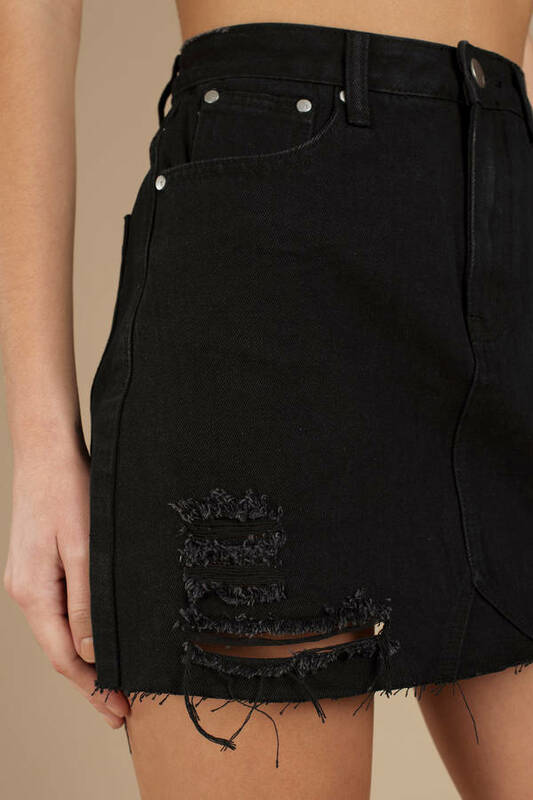 Live life on the edge with the Albury Black Distressed Denim Skirt. This ripped denim skirt features an A-line construction, high waisted fit, raw hem, zipper and button closure, and distressing at the sides. Pair this edgy skirt with a moto jacket and combat boots for a tough look.